One of the best ways to save on any home decorating project is to do it yourself, or DIY for short. DIYing cuts out the cost of labor for a project, which can be as much as 70% of the total. However, you still have to pay for materials – and when you’re really strapped for cash, even that cost can be too much for your budget. Fortunately, there’s one material that’s widely available, incredibly versatile, and practically free: shipping pallets. Pallets are small, sturdy platforms, usually made of wood, that are used to transport goods in trucks and planes or store them in warehouses. Using pallets makes it possible to move a whole stack of boxes or crates at once on a device called a pallet jack or pallet lifter, rather than having to load and unload them one at a time. Because pallets are so bulky, many stores don’t find it cost-effective to ship the empty pallets back to their point of origin for reuse. Instead, they either send them to be recycled or simply throw them away. 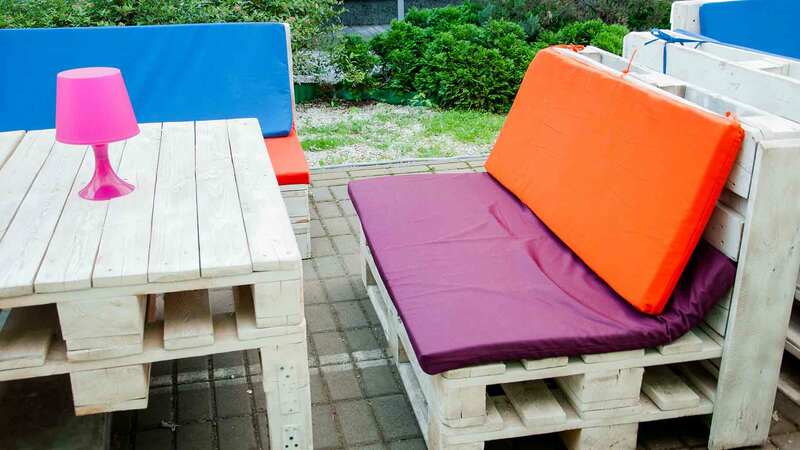 All these discarded pallets are a treasure trove for DIYers on a budget. Many stores are willing to sell their used pallets dirt cheap, or even give them away for free. This makes shipping pallets an abundant source of free or nearly free wood that can be used in a variety of home projects. And, while you’re saving money, you can also pat yourself on the back for doing your bit to help the planet by reusing and saving resources. You can use wood from pallets to make hundreds, if not thousands, of different items for the home and garden. There are whole websites devoted to the fine art of shipping-pallet construction, including 1001 Pallets and 101 Pallet Ideas. Sites like these show you in detail how you can use pallets to make art, refinish walls and floors, and even build entire pieces of furniture. Here’s a sampling of the most intriguing pallet projects to be found online. Decorators often stress the importance of creating a focal point in a room by grouping the furniture around an eye-catching feature, such as a fireplace or a picture window. However, if you happen to have a room that’s just a plain, white box with no natural focal point, you can create one by adding an accent wall. You simply decorate one wall in a contrasting color so that it that stands out from the rest of the room and draws the eye. While you can create an accent wall with paint or wallpaper, several ambitious DIYers have found that for the same price or even less, you can cover an entire wall in pallet wood. That vast expanse of natural wood creates a big, dramatic impact. This type of decorative project is a great way to put thinner pieces of pallet wood to good use, because the wood doesn’t have to support any weight. In fact, the thin pieces of wood that come from pallets are actually better for this job than thicker boards, because they’re lighter and easier to affix to the wall. You can find several gorgeous examples of pallet-wood accent walls online. 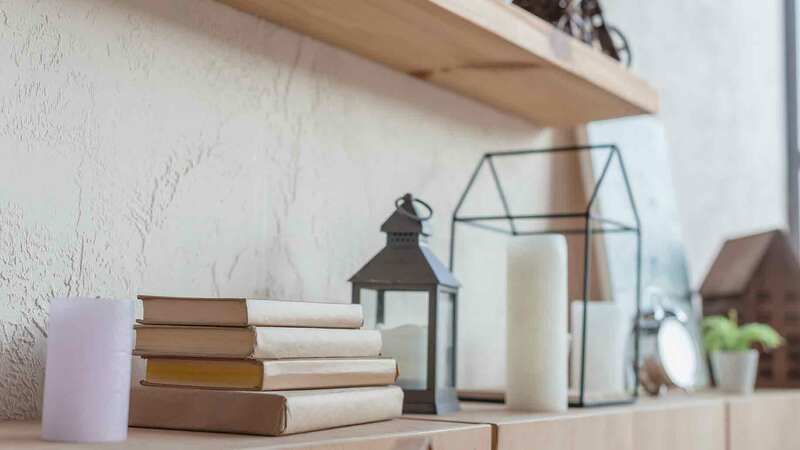 For instance, the bloggers at Cape 27 paneled a wall in their living room using approximately 70 pieces of pallet wood – around eight complete pallets – for a total cost of just $20. Katie of Addicted2DIY did a similar project in less time by purchasing pallets that were already broken down, so it took her only two days to sand them and secure them to the wall with glue and nails. Pallet walls are so popular that both 1001 Pallets and 101 Pallet Ideas have whole pages devoted specifically to this type of project. There are several ways to turn wood from a shipping pallet into storage for your books. One of the simplest versions is the small hanging shelves JennaBurger made for her son’s room. She just pried one strip of wood off the center of the pallet, nailed it to one end of the pallet, and then cut off that entire end, sanded, it, and stained it. By doing this to both ends, she was able to turn a single pallet into two small hanging shelves for her son’s room. The “tree shelf” design at Instructables is slightly more complicated. It requires a thicker pallet with hefty, solid blocks sandwiched between two layers of thinner wood slats. These thicker blocks form the shelf supports, while the thinner slats, attached at 90-degree angles, serve as the actual shelves. Alternating shelves to the left and right sides of the blocks gives you a tree-like shape. You can also make a freestanding bookcase from pallets, but it’s a more complicated job and requires more material. At Made With Love That Can Be Felt, you can see how the blogger broke down several pallets into separate boards, sanded them, and then reassembled the pieces into a four-shelf bookcase. Each shelf uses four wood slats lined up side by side, with three slats nailed crosswise to their undersides as a support. The finished piece has a rustic, Mission-style vibe. Coffee tables made from pallets are another popular project. It’s possible to make an amazingly wide range of styles from the same pallet wood. 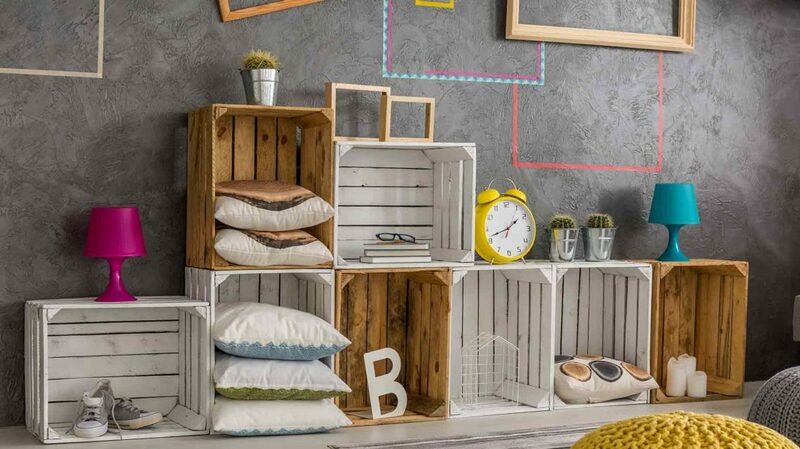 Some are as simple as two or three pallets stacked together and painted, a design that allows for storage in the hollow centers of the pallets. Others are much more elaborate, involving drawers or decorative inlays. For example, one simple piece shown at 101 Pallet Ideas is basically a top made from five side-by-side strips of wood with four legs made from the thicker support pieces. A simple frame of four more pieces nailed to the edges of the top gives it more structural support. By contrast, the bloggers at The Merry Thought made a much more complicated table using a combination of pallet wood, plywood, and framing lumber. After breaking down the pallets, they cut the wood strips on an angle and fitted them together on top of the plywood piece to make a fancy chevron design, alternating contrasting strips of lighter and darker wood. They added a shelf underneath this tabletop to hold books, toys, and magazines. If you make your own compost at home, it’s handy to have some kind of bin to keep your compost pile contained. You can buy ready-made compost bins or kits, but it’s much cheaper to make your own – and building with shipping pallets is one of the easiest ways to do it. The simplest designs don’t even require you to break the pallets down. A tutorial on Bob Vila shows how you can make a basic bin from three complete pallets joined with L-brackets to make a box, with a fourth pallet attached on hinges as a door. The gaps between the pallet boards let in air, which is important for composting, and allow excess water to drain. If you want, you can make your bin prettier by staining the outside and even creating small planters in the sides, but it works just fine without them. With a bit of effort, you can use pallet wood as a flooring material. This project is more complicated and costlier than creating a pallet wall, since you have to make sure all the boards you’re using are uniform in thickness, which may require running them through a plane. Their sides and edges also have to be even, and you’ll need to install a flat, level subfloor if you don’t already have one. All this takes a lot of work, but the results can be fantastic. At A Building We Shall Go, you can see how one couple broke down dozens of different-sized pallets and alternated planks of different sizes and colors to create a unique, intricately patterned wood floor. The blogger warns that the job isn’t cheap, since it requires a lot of special tools, and admits that they probably could have had a professional install hardwood floors for around the same price. However, the finished floor is unique, and she says she wouldn’t trade it for anything. 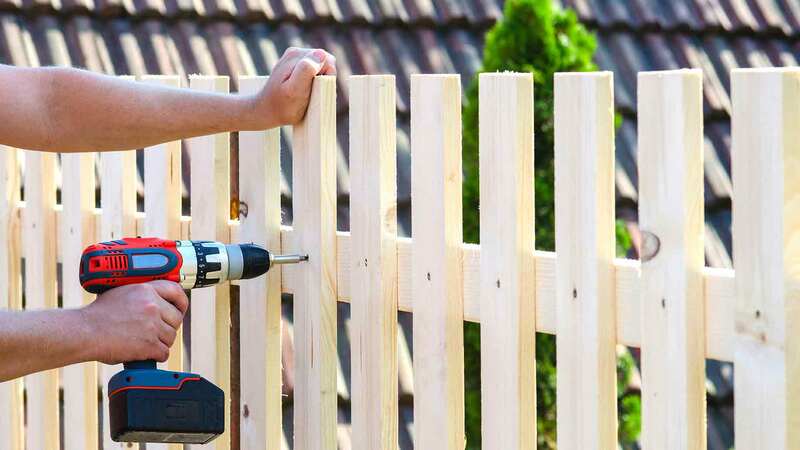 Hiring a contractor to install a fence around your yard or garden can be quite pricey. According to HomeAdvisor, this job can run you anywhere from $400 to $8,000, with the average cost nationwide coming in at around $2,650. However, if you build your own fence out of shipping pallets, you can do it for virtually nothing. Like compost bins, garden fences are easy to make with pallets because you don’t have to break them down first. All you have to do is line up a row of pallets side by side and nail or bolt them together. Adding hinges and a latch to one of the pallets allows it to serve as a gate. MorningChores offers several suggestions for altering this basic fence design to make it taller or grow flowers and vegetables in the crevices. One downside of a pallet fence is that the gaps in it can allow small animals, such as rodents or rabbits, to slip through. If you want to make your fence critter-proof, you can line it with chicken wire, stapling it to the inside. Another problem is that the pallet wood will eventually decay due to moisture and termites – but when it does, it’s cheap and easy to replace. It’s amazing how much furniture stores and home centers charge for patio furniture. A casual wooden Adirondack chair sells for anywhere from $60 to $200, and a simple outdoor dining set goes for $500 to $2,500. Picture frames are a great use for lightweight pallet wood, since they don’t need to support any significant weight. The blogger at Southern Revivals made some very simple photo frames using slats from the pallets, placed side by side, with two smaller crosspieces in the back. She then transferred her photos directly onto this wooden background using a product called Mod Podge. DIYPete created a slightly more elaborate pallet-wood frame for a raised relief map. The map itself already had a slightly raised edge, so he simply laid out the pallet boards around the edges, cutting each one at a 45-degree angle. After securing the pieces together with glue and nails, he added some quarter-inch trim to give it a more finished look. He then used a staple gun to secure the map in place. Besides using pallet wood to frame your existing art, you can also use it to create brand-new art pieces. There are many ways to create art from reclaimed wood, and shipping pallets are one of the best sources of free or cheap wood for the purpose. If you like to buy good wine on a budget, you need a nice budget-priced wine rack to store your collection. The blogger at Sweet Pea came up with a design for a hanging wine rack that holds five bottles, complete with storage for six wineglasses, using only a single shipping pallet. First, she cut off the bottom section of the pallet with a handsaw and removed the top board, creating a box. She removed the two middle connecting boards and used a jigsaw to put a decorative edge on the outer ones. After sanding it smooth, she screwed the removed top board onto the bottom to reinforce it. To make the storage for glasses, she removed an extra board from the pallet and cut a slot for each glass stem. Screwing this piece onto the bottom of the rack allows the glasses to hang below the bottles. Since she used no paint or stain, the only materials she had to buy for this project were a few screws. Now that you’ve seen all the different projects you can make with pallet wood, you’re probably excited to get started on some pallet projects of your own. The first step, of course, is finding pallets to use. 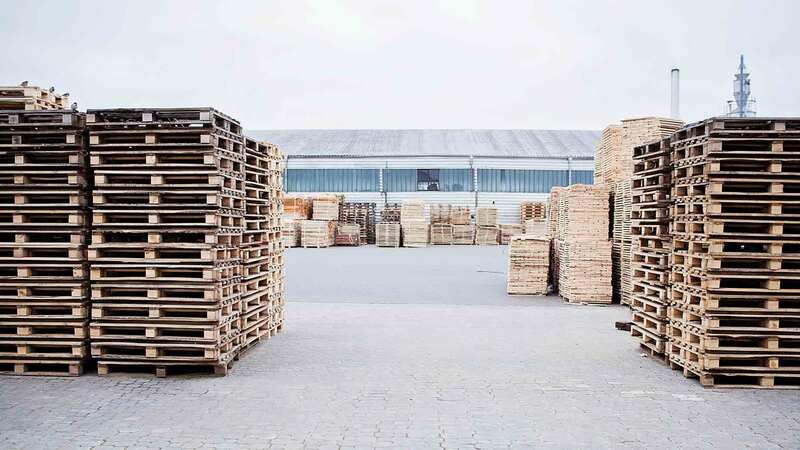 There are many sources of cheap and free pallets, but you have to know where to look – and you also need to know what kind to look for. Some pallets are treated with chemicals that make them unsafe to work with, so it’s important to know how to spot them before you start sorting through piles. One of the best ways to get pallets for free is to call around to small, local businesses in your area. Smaller businesses generally don’t have the resources to recycle their pallets, so they have to pay to have them hauled away for disposal. There’s a good chance these businesses will be happy to give their used pallets to an eager DIYer and avoid the fee. Grocery stores, pet supply stores, hardware stores, furniture stores, garden centers, motorcycle dealerships, and newspaper companies are all likely to have pallets to give away. Dumpsters. If you don’t mind getting dirty, you can often find pallets by scavenging in the dumpsters of local businesses. Small businesses often stack their pallets in a bin rather than call in a company to haul them away. However, be aware that many businesses aren’t happy to have people rummaging through their bins. If you’re spotted, the business owner might come outside to chase you off or even call the police. Whenever you can, it’s better to call the business. Or, go in and talk to the owner, and get permission to take the pallets. Construction Sites. New materials are sometimes delivered to building sites on pallets, which are usually discarded afterward. If there’s a construction site in your area, try swinging by and asking the workers if they have any pallets to dispose of. Again, be sure to ask permission instead of simply helping yourself. Trespassing or taking materials from a construction site without permission is illegal in most places. Newly Opened Businesses. 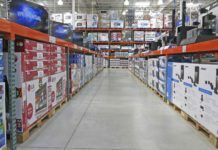 When a new mall, store, or other business opens in your area, it’s likely to bring in a lot of wares on shipping pallets. You can show up at the site and offer to take these pallets off the owner’s hands. Some business owners will let you take them for free, while others will charge a small fee. Closing Businesses. Similarly, when stores go out of business, they have a lot of old goods to dispose of – including old pallets. These businesses will probably be happy to let you have their pallets so they can avoid disposal costs. Craigslist. It’s very common to find offers of shipping pallets in the free section on Craigslist. However, 1001 Pallets warns that these free pallets tend to go quickly. If you want to find pallets this way, check the listings often, and call as soon as an offer shows up. Internet Listings. Aside from Craigslist, there are various other sites online that sometimes have free or cheap pallets on offer. 1001 Pallets has a page devoted to Pallet Classified Ads that you can search by location. You can also check social media sites or simply do an Internet search for pallets with the name of your town. It’s also possible to purchase pallet wood in bundles from Home Depot. These bundles are pricey – about $27 for 8.5 square feet of material – but they save you the work of breaking down the pallets into individual boards. If you’re more interested in pallet wood for its looks and sustainability than for the money it can save you, buying broken-down pallets could be worth the cost. Always Ask. Even if you just want to grab a pallet that you’ve spotted in a dumpster, it’s best to walk in and ask the store owner if you can have it. Businesses are much likelier to help you if you approach them in a polite and friendly manner. Time Your Request. The best times to approach a business to ask for pallets are first thing in the morning and late in the day. These are usually slow periods, so the owners should be more willing to take time to talk to you. Morning is probably best, since goods are usually delivered then and the store is more likely to have pallets available. Share Your Plans. Store owners are more inclined to give you free pallets if you explain what you want them for. Telling them what you’re planning to build – a playhouse, a picnic table, a chicken coop – will pique their interest and make them more willing to help you out. Avoid Certain Industries. Shipping pallets from a company that makes pesticides or processes chemicals are likely to be contaminated with these products. A good rule of thumb is, if you wouldn’t want any of a company’s product on your furniture, you don’t want to use that company’s pallets to make furniture. Dry-goods stores, by contrast, tend to have nice, clean pallets, since they haven’t been used to ship anything that could spill. Check for Spills. Pallets from grocery stores are sometimes fine, but they can also be covered in spills, stains, or mold. Before picking them up, examine them carefully. If the pallet looks or smells funny, don’t take it. Look for the Code. Any shipping pallet that’s come from overseas will be marked with an IPPC code (for International Plant Protection Convention, a branch of the United Nations). It has a two-letter country code followed by a unique registration number, and below that, two more letters saying what type of treatment was applied to the wood. If the treatment code is DB (debarked), KD (kiln dried), or HT (heat treated), the wood is safe to use. If it says MB, the wood is treated with toxic methyl bromide, and you shouldn’t use it. If a pallet has no IPPC code at all, that means it has been used only within one country. Most domestic pallets are not treated with chemicals and are safe to use, but you can avoid them if you want to be absolutely sure. Handle With Care. Even if the pallet is made from clean, safe wood, it could still have loose splinters or nails that could injure you. Always wear sturdy gloves when you’re moving pallets. Use a Roof Rack. If you can’t fit pallets in your car, try carrying them on your car instead. You can fit about two standard-sized pallets on a roof rack and hold them down with some strong rope. Don’t rely on a bungee cord; you need to make sure they’re held down securely so they don’t slip when you round a corner. Borrow a Bigger Car. If you have a friend or family member with a larger car or truck, ask if you can borrow it to haul your pallets home. To sweeten the pot, you can offer to fill up the car’s gas tank on your way home. Alternatively, you can offer a share of your new pallets. Rent a Truck. There are several places where you can rent a truck or van by the hour. Home Depot offers truck and van rentals at $19 for the first 75 minutes and $5 for each additional 15 minutes. You can also rent a small truck from a moving company like U-Haul for around $20. Of course, this adds to the cost of your project, so do the math first to make sure it wouldn’t be cheaper to simply buy the wood. Hire a Driver. You can sometimes find listings on Craigslist from people who own vans and are willing to help with hauling for a small fee. You can also use an app like TaskRabbit to find people who can help you haul your pallets home. Choose Smaller Pallets. Although 48-by-40 is the most common pallet size, it’s possible to find pallets that are smaller. According to 1001 Pallets, 42-by-42 pallets are common for hauling paint, and for supplies used in the telecommunications industry. You can also find 40-by-40 pallets used for dairy and 36-by-36 pallets used for other beverages. Pallets this size can fit into the back seat of a small car easily. You’ll just have to break down more of them to get the same amount of wood. Break Them Down First. Finally, if you have plenty of time and the right tools, you can break apart your pallets into separate boards before loading them into your car. On 1001 Pallets, you can find instructions for several different methods of breaking down pallets: using a hammer and chisel, a pry bar, a hacksaw, a Sawzall, or a special pallet dismantling bar. Just remember to wear gloves and goggles while you’re breaking apart the pallets so you don’t injure yourself. Also, check for stray nails before loading the dismantled pallets into your car so you don’t damage the upholstery. The projects listed here only scratch the surface of what it’s possible to do with shipping pallets. Do an online search for “pallet projects,” and you can find literally thousands of other ideas, including beds, lamps, pet furniture, and even entire structures. Chances are, if you can make something out of wood, someone has found a way to make it with pallets. However, building with pallets isn’t the only way to get furniture and accessories on a budget. Depending on what you’re looking for, you might be better off shopping at garage sales, visiting thrift stores, hunting on Craigslist and Freecycle, or hitting the as-is section at your local furniture store. Often, these sources can offer furniture bargains for a lot less work – and sometimes even less money – than it would take to build your own. On the other hand, if your goal is not just to save money but also to have the thrill of making something with your own hands, pallets can be a great way to do it. Because each pallet is different, building with pallets will give you a unique piece that will be different from anything you could buy in a store. Plus, you’ll get the satisfaction of being able to tell your friends that you made it yourself, which is a pleasure money can’t buy. Have you ever built anything with pallets?